Rhubarb, for many, is an acquired taste, often not acquired till adulthood. I did not acquire the taste until a few years after I moved to Germany. Rhubarb is the harbinger of springtime, and like Spring it is transient and delightful. Appearing in April and sometimes lasting as long as July, rhubarb is in actual fact a vegetable masquerading as a fruit. 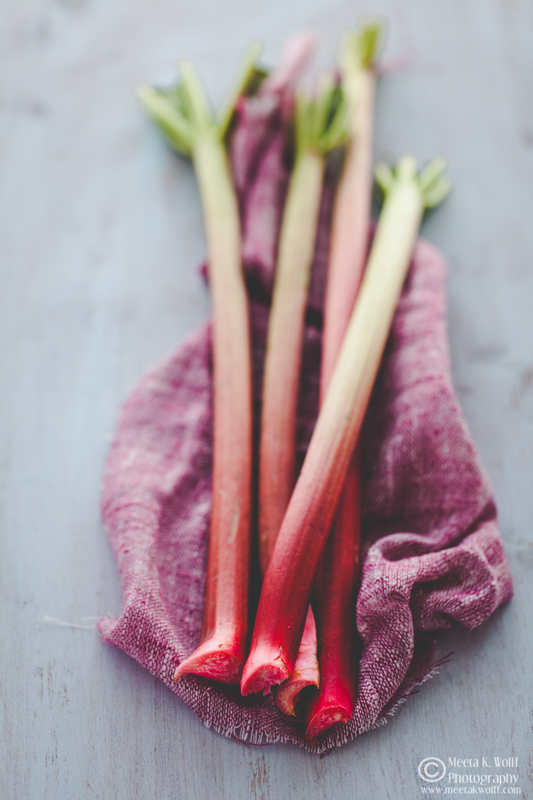 It's best to seize rhubarb's moment as soon as it appears at the markets and take full advantage of the delicate stalks. Rhubarb was never really on top of my list of favorites till I came to Germany, married my husband and acquainted myself with the German cuisine through my late mother-in-law. In a country, where eating seasonally is a fact of life, Germans often wait eagerly through the long winter for the first ruby red stalks to appear at the markets. My mother-in-law would stock up on rhubarb as soon as they began showing up at the markets and grocery stores. Jars were sterilized and filled with spiced rhubarb compote, jams or poached rhubarb to be used throughout the year. Then came the cakes and tarts - my mother-in-law's rhubarb vanilla sheet-cake was a delicate mix of tangy and sweet heaven. As my palate developed, I began relishing the tangy punch of rhubarb but found it was often smothered in too much sugar and cooked to a pulp. I began experimenting with savory dishes, allowing a hint of that refreshing sourness to highlight a pork or poultry dish. 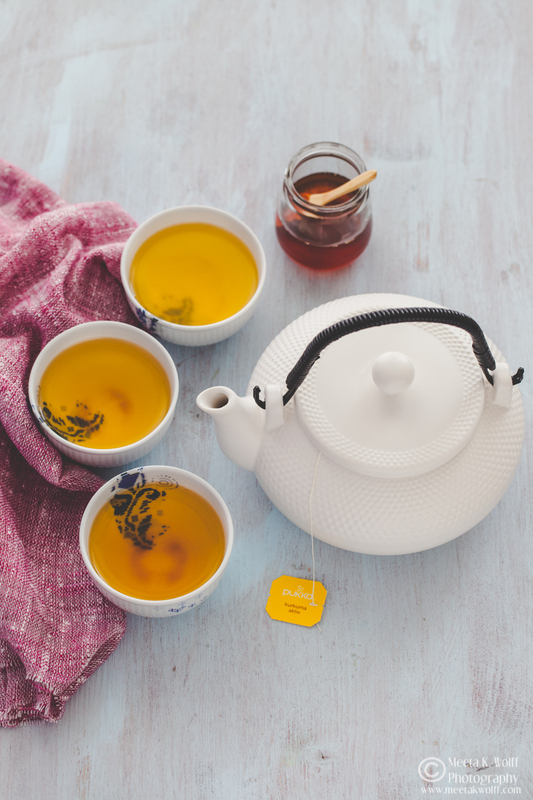 In tarts and cakes, I often replaced sugar with something mellower like honey to complement the earthy and delicate flavors. Then came the beverages and cocktails - if you have never tried making rhubarb vodka - it is a truly wonderful thing! Rhubarb pairs well with a variety of flavors and is adaptable to use in savory and sweet dishes. Strawberry is probably the favorite partner but try apples, apricots, ginger, citrus flavors, black pepper as possible rhubarb partners too. Use rhubarb in crumbles, or drop pieces of rhubarb in muffins and breads or stir heaps of poached rhubarb through thick Greek yogurt topped with granola, sauté rhubarb and honey for a light quinoa salad, or roast with onions and pork chops for a tangy savory dish - the possibilities are limitless. 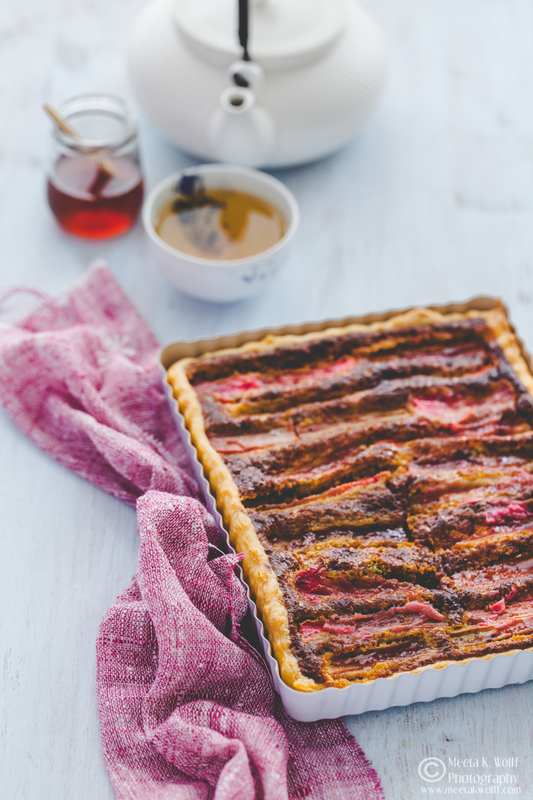 One of the first things I love making when rhubarb comes into season is a quick and easy tart to satisfy the rhubarb desires quickly. 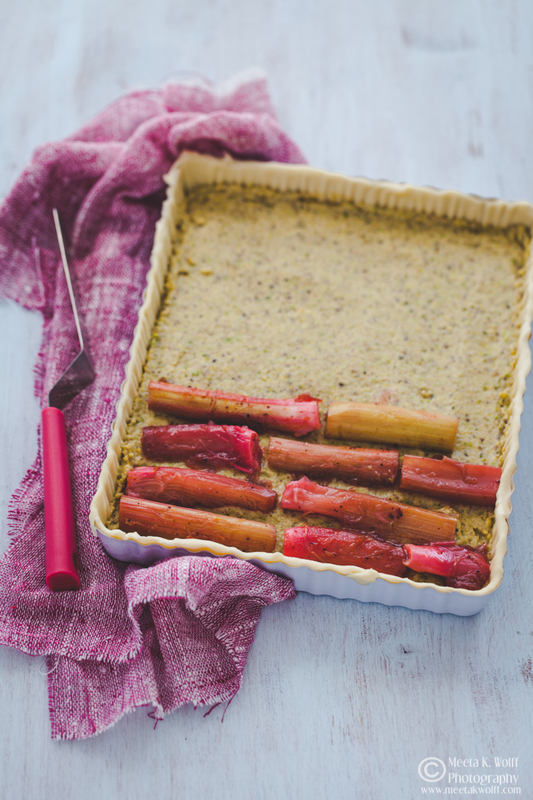 The vivid green pistachio frangipane is a royal bed for the poached rhubarb scented with a hint of cardamom. 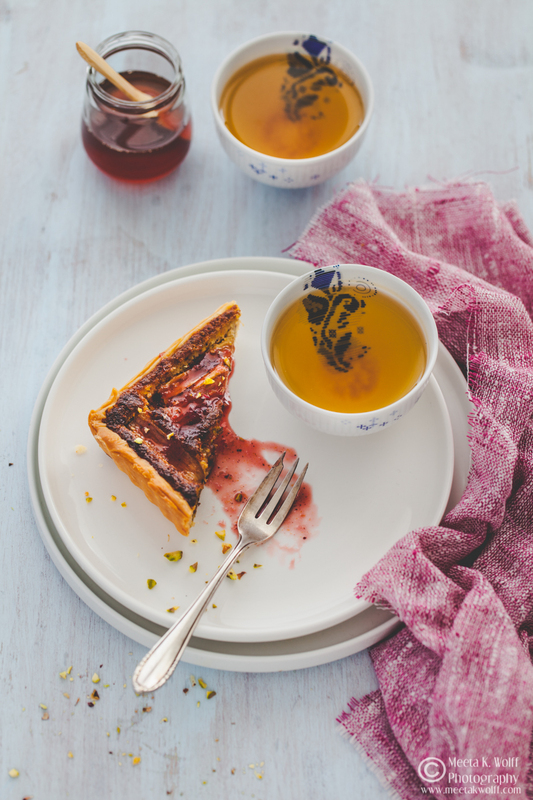 Paired with the crumbly buttery crust this tart is an elegant teatime partner to welcome the glorious days of Spring. To make the pastry crust tip the flour, icing sugar and a pinch of salt into a mixing bowl, dice the butter into cubes and rub it in using your fingertips until the mixture resembles breadcrumbs. Add the egg yolk and 1-2 tablespoons of cold water and knead the dough together with your hands until combined. Try not to overwork the dough; stop as soon as it comes together in a ball. Wrap, then chill the dough for 20 minutes. Once the dough has rested, roll it out until it is approx. 3 mm thick. butter a a tart pan. For a round one use 23cm-diameter for a square tart form approx. 21 x 21cm. Carefully transfer the crust to the tin, pushing it into the corners, and patching up any cracks or tears. Trim any overhang. Leave the pastry to chill for 20 minutes. Preheat the oven to 190°C, fan 170°C. Blind bake the crust: Scrunch up a sheet of baking paper into a ball, then lay it over the crust. Fill this with baking beans, making sure that you press them into the corners. Transfer the tart form to the oven and bake for 20 minutes, then remove the baking beans and paper, then cook for another 5 minutes until golden. While the tart crust is baking make the rhubarb. In a large skillet, combine the water, sugar and cardamom and bring to a boil. Add the rhubarb stalks, reduce the heat to a very low boil and poach the rhubarb for about 3-4 minutes, until just soft. Make sure not to move the rhubarb around too much as it may fall apart. Remove with a slotted spoon and let cool on pieces of paper towels. Make the pistachio frangipane: In a food processor, process the pistachios until finely ground - do not over process. Add the butter and raw honey and process until well blended. Pour the frangipane mixture into a bowl and with a whisk, mix in the eggs and heavy cream. The idea is not to incorporate to much air into the mixture to avoid cracking when the mixture rises during the baking period. Assemble the tart by spooning the frangipane mixture into the tart shell, arrange the rhubarb pieces over the frangipane. Bake for 40-45 minutes or until it starts to get golden brown. Serve warm or cold with dollops of crème fraîche and some rhubarb syrup (see notes below) drizlled on top. Once you have poached the rhubarb and removed with a slotted spoon, cook down the liquid until it reduces to tha thick syrup. YOu can use this to drizzle over the crème fraîche instead of honey. Sharp and delicate the poached rhubarb is the perfect contrast to the sweet and nutty frangipane. If you do not have time to make the crust then please feel free to buy a good butter puff pastry crust, which works equally well. I personally love the hint of cardamom in the rhubarb compote, adding a bold earthy character to the entire tart. Substitute cardamon with cinnamon, lemon zest, vanilla or even black pepper for other flavor variations. 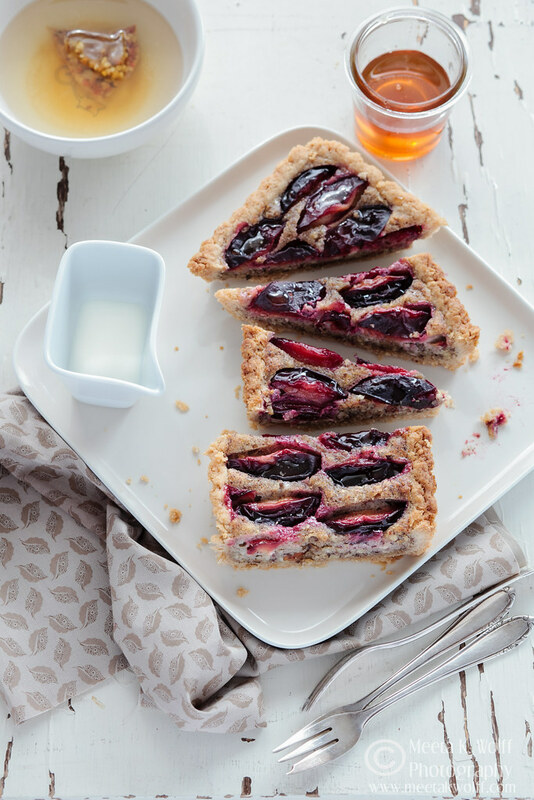 The main thing is to enjoy this stunning tart with family and friends! More sweet tarts for Spring and Summer on WHat’s for lunch, honey? Wow that looks delicious! such a great idea to do for rhubarb season! This is the most amazing rhubarb tart I've ever seen. Gorgeous! This is gorgeous! I love rhubarb.. I love pistachios.. but never thought to combine them! It sounds delicious! Wow what a great combo, so many great flavors! This looks so delicious! I definitely will have to try and make this! Your photos really bring this to life. It looks so tasty and easy to make. I might have to try this for my next tea time. This looks so delish! Perfect for afternoon tea or dessert! Looks absolutely perfect! I never tried rhubarb tart before! My gram used to make a yummy strawberry rhubarb tart thing. I would love to try her recipe with a twist of yours together! This sounds good! This looks delicious! 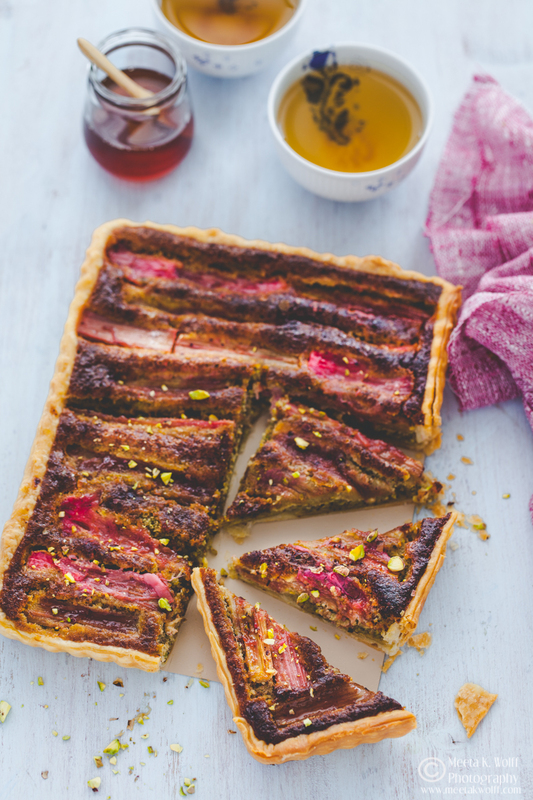 I haven't had anything with rhubarb in it since I was a kid so I totally want to make this! You have no idea how much I appreciate well photographed food blogs! So cool! It all looks great! This looks so good. I have yet to try eating rhubarb. Oh this sounds so good! I will have to try it sometime. VERY nice and good post i like your post. You have no idea how much I appreciate i like your post.